Some more work done on the map today: borders and cities added, railways and ocean zones, nations have been named with suitably English themed names. All nations except Midland have three cities, Midland has four. All nations have some kind of rail network, except Lumbria. Midland is the only nation with a good rail network, and there are definitely places that are barren of railways. Before the game starts player teams will have the opportunity to build some more railways and cities (or to increase their standing armies and fleets). One lesson I have learned for rapidly adjudicating combats for control of zones is to avoid having stacks of a dozen or three dozen units. It takes a long time to count them. So one big step for navies in Pax Vicky is that each nation will have a small number of Fleet units, perhaps 3-6 each depending on pre-war options. Each Fleet will have a strength of 6-9, representing various squadrons of battleships and support ships (and strength will depend in part on pre-war options). So on the Pax Vicky map I have around 27 sea zones, each with a name and a control box. This is less than the number of fleets the nations will have. While some sea zones will fall naturally into one player’s sphere of influence, others will be hotly contested. Midland has one of the worst naval positions, having three different areas of naval operations, and no easy way to transfer forces between them. 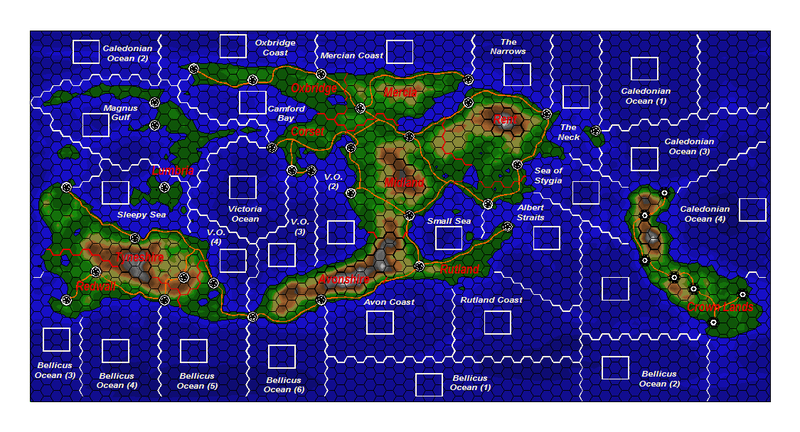 All nations are within 2-3 sea zones of the Crown Lands, the uncontrolled territory at the start of the game. Any nation or coalition of nations able to control the Crown Lands and maintain a convoy route there will gain a considerable economic boost in the game. You control a sea zone if you have units in the control box. If you don’t control a sea zone, your naval counters are placed anywhere in the sea zone, outside of the control box. Some cities are located on the boundary lines of sea zones, this is deliberate and will allow fleets based there to project forces in either sea zone easily (or at least get repairs more effectively). Merships (Merchant Ships), contribute towards gaining trade cards. There are two main approaches to steam age naval warfare with bloody big battleships: seek decisive battle, or avoid decisive battle and raid the enemy where they are weak. You generally try and seek decisive battle when you have a superior battle fleet or if you are pressed by circumstances to gamble. Mahan’s advice here is to “never divide the fleet” (i.e. if you split your fleet up and send it in different directions, its likely to be defeated in detail). When you are weaker, a sound strategy is to hide your fleets in safe habours, emerging only when the situation changes. Meanwhile, smaller vessels are sent off to raid the enemy shipping lanes, sinking ships, disrupting commerce, driving up insurance rates, and so forth. In the 20th century this was largely done with submarines, although to keep things simple for Pax Vicky I am assuming raiders to be light cruisers, with the endurance to sail a long way away from home bases. The strategic objective of naval combat is control of the seas. In Pax Vicky there is a bonus to be gained from being able to trade, and a massive penalty for being blockaded (having no sea zone that you control adjacent to a friendly controlled port). Naval Forces have infinite movement through sea zones where naval HQs are present. Movement stops if you enter a sea zone without an HQ, and only Raider unis can move from a zone without an HQ into another zone without an HQ (all other forces have to go home and refuel). Naval combat is optional. The oceans are big and easy to hide in. If a player does want to fight they can choose to either raid, or seek decisive battle, but not both in the same turn in the same sea zone. Naval forces can only fight once per turn. If you control a sea zone, with a fleet, and no other fleets are present, you can automatically assert control and force all Cruisers, HQs, and Merships controlled by other players to leave that zone. Draw a card for the attacking player. The card will have a number from 1-10. If this number is greater than the enemy fleet strength, then they are not found and no battle occurs. If the enemy fleet is found, draw a card to see if their scouts spot the attacker. This happens if the card number is equal or less than the attacker’s strength. If the attacker is not spotted, then the defending fleet has been ambushed. Draw two cards for a Fleet that is stronger than an enemy Fleet. Draw one card for Fleets of equal or weaker strength. Draw a bonus card for an Ambush. Note that there is a strong advantage in favour of the stronger fleet which is difficult to reverse except through luck or attrition over time. A card “hits” and does damage if the number on it is equal or less than Fleet strength. Otherwise the card “misses” and does no damage. A small number of cards have symbols for critical hits and inflict two damage if successful, otherwise damage is one per card. Each hit on a Fleet reduces its strength by one. Mark this by placing a counter on the Fleet. Any Fleet with five or more damage counters is no longer capable of remaining at sea, and retreats to the closest controlled port. Damage counters persist until repaired in a logistics phase. A Fleet loses the battle if it is forced to retreat from five points of damage accumulation. If a Fleet misses with all cards when its opponent hits with at least one card, it also loses. If both Fleets score at least one hit, fight another round of combat. Repeat as necessary until a winner is determined or both fleets are forced to retreat. Note that five points of damage will take a long time to repair, possibly as many as three naval logistic turns. This is similar to Fleet battles, however the Raider is attempting to intercept the Mership, while the Cruiser is attempting to intercept the Raider. So a Raider always ambushes a Mership, and a Cruiser always ambushes a raider (if they manage to intercept at all). All these units have a nominal strength of 5, although a Mership cannot damage a Raider. Any damage done to a Raider, Cruiser, or Mership forces it to retreat. You may have to click on the image to see the headings clearly. I am yet to commit to firm boundaries and city placements on the map, mainly concentrating on where the nations will go, and how many other nations they will be adjacent to. The Fallow Lands zone is some empty space for the players to squabble over, and a major reason to contemplate building a long range amphibious capability. As a rough rule of thumb for geopolitics, the more states your state is adjacent to, the more likely you are to find it difficult to defend yourself. 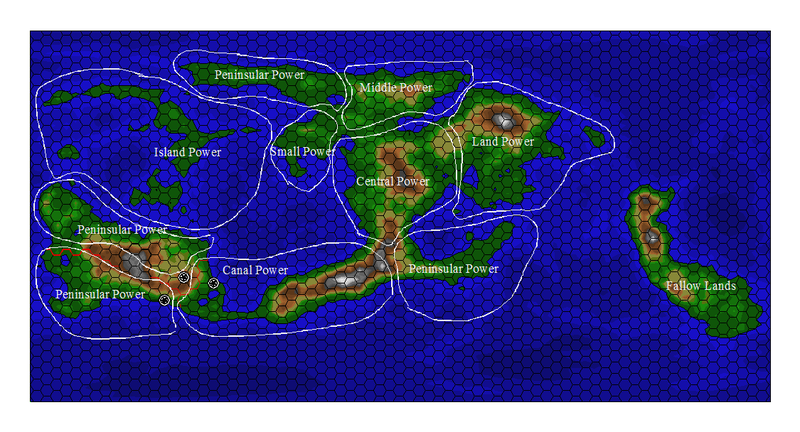 Terrain can modify this (such as mountains, rivers and fortresses). So on the whole those states listed as Peninsula Powers have only two land neighbours to worry about. The obvious strategy here is to ally with one against the other. The Canal Power will control a route through the narrow isthmus of land that permits Naval forces to move swiftly between the “interior” and “exterior” oceans. Possibly influential, but it has long coastline that is hard to defend against landings, and four neighbours to worry about. The Island Power, by dint of having no land neighbours, will probably be a strong naval power like England. Its controlling players could choose to build a lot of land units, but its not going to do them a lot of good. The Small Power is the potential Switzerland of the map. It has short borders that could be completely fortified by a defensive player, but the key to its success would be skillful diplomacy. The Central Power is the hub of the main continent, especially as all the railway networks will connect up in its cities, giving it a strong logistic base and the ability to move armies around on interior lines. It does have to worry about the Land Power though. The Land Power is big and has only one obvious route for landward expansion. I may make it harder for it strategically by giving the offshore island to another nation and possibly giving a strip of its southern coastline to another player as well. The Medium Power will be weaker than the two largest powers, but stronger than the other powers. Its interesting diplomatic challenge is going to be steering a course between neutrality or alliance with the larger powers. Before changes are made by players, each state will have an existing army and navy that is based on its geography. Naval strength will be based on length of coastline, number of ports, and the number of sea zones the nation is adjacent to. Army strength will be based on the number of controlled hexes, number of cities, and the number of adjacent nations. Nations are likely to have around 10 units per player on the nation team, but some will have stronger armies than navies, or vice versa, and not all units will be available at the start of the game (i.e. reserve forces will be built during the game). Its going to be impossibly for most nations to garrison their entire land border (the small and island powers are an exception) so that feeling of vulnerability is going to encourage diplomacy and surprise attacks. Naming the countries and drawing definite borders. Then the cities and railways need to go on the land mass, and the sea control zones on the oceans. Last weekend I sent the outline of Pax Victoria off to Saga for consideration for BOD in 2013. I also spent some time looking at the old Flower Power rules, and what worked and what didn’t. A key design goal for Pax Victoria, is for player teams to design a grand strategy before the convention, so the night’s game is more about the success or failure of executing that grand strategy. The more objectives you select, the harder it will be to “win”, so I will be giving states with Napoleonic ambitions some bonuses. I’m still thinking about the math on this one, and I may hide the formula from the players, but a team that wants to play like Germany in 1914 is going to have a much better army to play with than a team that wants to play like Belgium in 1914. Some options grant absolute rewards, i.e. they result in fixed and predictable changes to resources. Other options grant relative rewards, i.e. the benefit gained depends on the options selected by the other teams. Fortress: an immobile combat unit placed in a specific hex, useful for defending key objectives like cities, ports, and terrain choke points. The earlier it is built, the stronger it will be. Factories: produce logistics, which are needed in the option phase to build some units (maybe, will need to do some math here), and in game play to resupply exhausted units. The earlier you build factories, the larger your stockpile of supplies at the start of the game. Canal: not sure about this, but I might build some narrow land areas where a canal mega-project could be attempted, it would facilitate naval movement. Merchant Ships: factories of the sea, again, not sure if the complexity is needed, but it may add another reason to engage in naval warfare. Army HQ: acts as a rail hex for the purposes of moving supplies, can resupply adjacent units (so if you don’t build any you will lose any war you fight in as your units are slowly destroyed, and if you want to invade a region that lacks railways you will need a lot of HQs to avoid a Retreat From Moscow situation, one per three hexes of hostile border is probably good). That is probably more than enough options! Teams also get to choose how liberal/conservative they are. Liberal states will generally start with larger armed forces, while more conservative states will start with higher quality armed forces and a lower chance of mid-game rebellion. General philosophy with mechanics is that ground combat is hex positional and attrition based, while naval combat is area based and more decisive than land combat (i.e. the losing side takes more damage). Each state has two action tokens per map: Regular and Elite. In a regular action token, all units can move/attack. In an elite action token, only elite units can move/attack. I will also have one “Big Push” action token per map, which is sold each game turn to the team bidding the most logistics points. The Big Push token is a Regular action token with a +1 bonus on all attack rolls. Action tokens are resolved in a random sequence. Each time one is pulled, each player on that team can resolve one move/attack. Each unit has a strength value, an average number for a rested unit is 11, with elite units being 12-13, and weaker units on 9-10. An exhausted unit generally has half the strength of when it was rested. When you attack, you roll 1d6 for each unit adjacent to the hex being attacked. Elite units add +1 to their roll. Artillery units can contribute with a ranged attack. The attacker must “flip” counters with a strength value equal to their roll. You must try to match the required strength loss if at all possible. If a reduced strength unit is “flipped” it is removed from the board (to be rebuilt later if you have the logistics for it). The Defender does the same, except they can use terrain to negate die rolls (lowest dice first). So mountains, cities, rivers, forts, etc make it easier to defend. So you want to attack weak units, or units that can be flanked from multiple hexes. If you do enough damage to eliminate a unit, then Cavalry units can exploit through the gap. Otherwise if the defender is weakened, and the attacker has a full strength unit remaining, the defender retreats one hex (towards nearest HQ or city). Note: due to the slow nature of this combat system, states will be relatively small – the distance from a border to a capital is likely to be three hexes on average. Naval combat – terrain has no effect at sea, roll 1d6 for each unit in the fleet. High roll wins control of the sea zone. It’s unwise to engage if heavily outnumbered. I may have to develop some kind of “raid” mechanics to allow hit & run attacks by small forces.